I spent the last full moon weekend in Oregon visiting my oldest friend, Angus. In the 20 years that we have known each other, we have had plenty of epic adventures in New Hampshire, Seattle, SF, Portland, and NY. Usually one of us is visiting the others new home town and the fun follows. However, on this trip out to see Angus in Portland, I suggested we do a road trip around the Oregon Coast. Recently i was easily guilted into purchasing a 4×5 large format camera by another dear friend, David Brommer. He had been nudging me this way, calling all my cameras “weenie format” as he lugs around his beautiful 8×10 Deardorff. 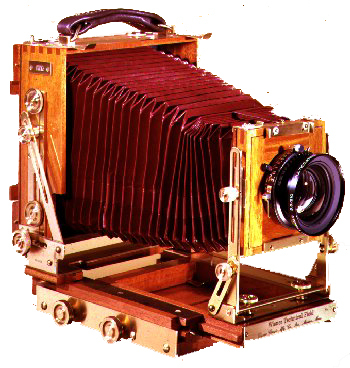 The Large Format cameras really haven’t changed that much in the last 75+ years. They’re usually wooden, need a tripod, a dark cloth to view the image, and produce negatives/positives that are 13x larger than a 35mm neg. You get optimal image quality and less to enlarge in the dark or lightroom. Pictured on the left at the bottom is what my Wisner Technical Field camera looks like, red bellows and all. It only weighs 6 lbs and I love it! So I have been “getting to know” the Wisner lately and wanted to dedicate this trip to Large Format shooting. I warned Angus that if he thought I was an annoying photographer friend before, this LF camera would only make things worse. My man has the patience of a saint and did a good job documenting our escapes! I probably got it down to about 8 minutes to set up and 2 minutes to break down the camera. My shortest exposures were 1/4 of a second and my longest 30 minutes. However, I decided to throw a wrench into the whole process and wanted to get some 4×5 nocturnal images. Again, you’re looking through a 4×5 inch piece of glass with a loupe under a dark cloth to focus. This is not the most conducive way to focus at night and required me using lots of high powered flash lights or simply not shooting certain subjects because I couldn’t see or focus on them. 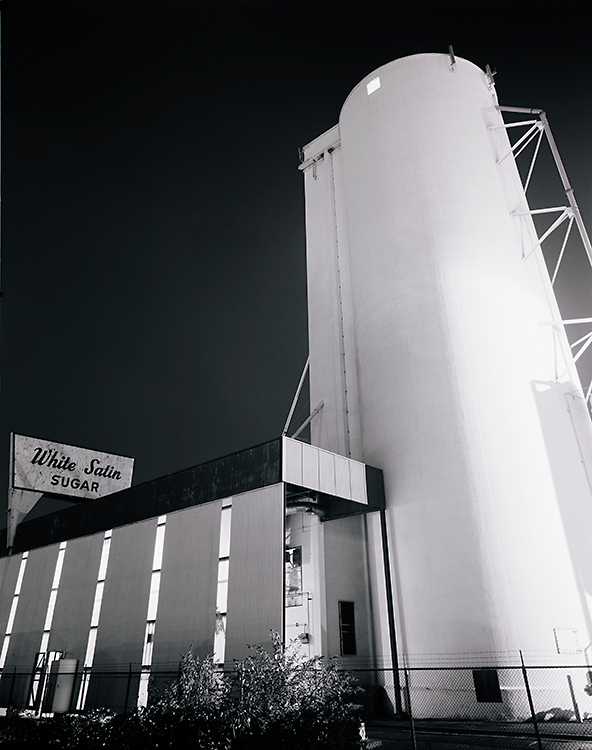 The first shot of the White Satin Sugar Factory is the simple story of passing by a subject several times and saying to yourself, “I’m going to shoot that.” I knew it would make a great night image, my only concerns were the trains that were frequently running or parked in front of the factory; plus every other time I drove down this street, several cops were pulling over “perps”. Lo and behold, when I arrived at 12:30am to shoot, 3 cop cars were across the street and a train was parked in front. Not wanting to be mistaken for a perp, I parked about 50 feet from the cops and as I got the gear ready the train started to pull away. I dashed across the street, crossed two sets of train tracks and went down a small incline to take the first test shot which was a 7 minute exposure. Right at the end of the exposure, another train pulled up and parked, completely blocking me from the street and cops. I moved the camera to a better position right between the two sets of tracks and started my 14 minute exposure. I had to stop the exposure 11 minutes through because the train next to me started to chug and take off. It was obviously shaking the ground and I did not want it to affect my picture. Luckily you can easily do multiple exposures with LF cameras so 2 minutes later I finished off the exposure and left the scene. When I got home from this trip I developed my test shots first and then fine tuned my developing for the final negatives. The correct exposure was 7 minutes at f16 and this image was 14 minutes, so I underdeveloped this negative by one stop and saved those precious highlights on the right from getting blown out. The other two images were taken at the ever popular Cannon Beach on the Oregon Coast. The whole coast is pretty amazing with massive rocks, ancient trees and cliffs all coming together to form something very primordial. Haystack Rock has probably been captured millions of times and as Angus and I strolled down the beach I wondered when the last time it may have been captured with a LF camera. As I was setting up a shot under the dark cloth, I peered out to find about 8 people gathered around me wondering what the hell I was doing. 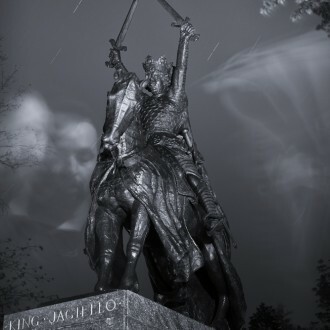 I let everyone take a peak at the image’s reflection on the glass under the cloth and gave a brief history of photography. One guy thought he was going old school by bringing his 10 year old Sony Mavica digital camera that writes directly on CD. He quickly conceded to me. Enjoy, and more stories and images to follow! Glad to make ya a real shooter Gabe. It took me years before I jumped into LF photography and I must say- it offers the most photographic satisfaction. What goes on under the dark cloth is a mystry to digital photographers!!! And we like it that way! Now if I can only get you into shooting paintballs…. SO glad that you came out and that we finally made it to the coast. It’s always a delight to see you in action, lugging your latest gear and capturing some magic. I’m looking forward to seeing more of the shots from this trip- because I know there were plenty! Next trip: Mount St Helens. Or the Columbia River Gorge. Or Crater Lake. Or the south Oregon coast.